Due to the curved edges of this phone and screen protector, it is extra important to make sure the protector is aligned 100% in the application. 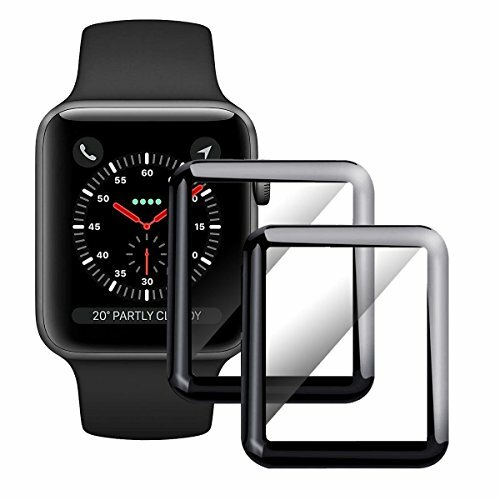 Perfect for iWatch Screen Protector: Widely compatible with Apple Watch 42mm Series 3/2/1! Easy Installation and bubble-free. 3D Curved Edge Full Coverage: Cover the whole screen to protect against dirt, dust, oil and sweat effectively, Black frame with glues around the curved edges. 9H Hardness Tempered Glass: Protect your screen from bumps, scratches, scrapes and other external damages, keeps your iWatch screen safe. 2 pcs Screen Protectors: Give the extra one to your friends and family so they can enjoy the benefits, or keep them for emergency replacements! If you have any questions about this product by Moresky, contact us by completing and submitting the form below. If you are looking for a specif part number, please include it with your message.